Production: Road Movies (Berlin), Argos Films (Paris), Westdeutscher Rundfunk (Köln); black-and-white and color (Kodak), 35mm; running time: 130 minutes. Released 18 May 1987. Filmed on location in Berlin. Cost: $3–3.5 million. Producers: Wim Wenders, Anatole Dauman; executive producer: Ingrid Windisch; screenplay: Wim Wenders, Peter Handke; photography: Henri Alekan; assistant director: Claire Denis; editor: Peter Przygodda; sound: Jean-Paul Mugel, Axel Arft; art director: Heidi Lüdi; costume designer: Monika Jacobs; music: Jürgen Knieper, Laurent Petitgand (circus music), Nick Cave and the Bad Seeds (songs). Cast: Bruno Ganz ( Damiel ); Solveig Dommartin ( Marion ); Otto Sander ( Cassiel ); Curt Bois ( Homer ); Peter Falk ( himself ); Nick Cave and the Bad Seeds ( themselves ); Lajos Kovacs ( Marion's acrobatics coach ). Awards: Cannes Film Festival Award for Best Director, 1987; Bavarian Film Award for Best Director, 1988; German Film Awards for Outstanding Feature Film and Best Cinematography, 1988; European Film Awards for Best Director and Best Supporting Actor (Bois), 1988; National Society of Film Critics Award for Best Cinematography, 1988; New York Film Critics Circle Award for Best Cinematography, 1988; Los Angeles Film Critics Association Award for Best Foreign Film and Best Cinematography, 1988; Sao Paolo International Film Festival Audience Award for Best Feature, 1988; Independent Spirit Award for Best Foreign Film, 1989. Wenders, Wim, and Peter Handke, Der Himmel über Berlin, ein Filmbuch , Frankfurt, 1987. Kolker, Robert Phillip, and Peter Beicken, Wim Wenders: Cinema as Vision and Desire , Cambridge, 1993. Morgues, Nicole de, Les ailes du désir, Der Himmel über Berlin: étude du film de Wim Wenders , Linnebonne, 1998. Jaehne, Karen, "Angel Eyes: Wenders Soars," in Film Comment (New York), June 1988. Paneth, Ira, "Wim and His Wings," in Film Quarterly (Berkeley), Fall 1988. Fusco, Coco, "Angels, History and Poetic Fantasy: An Interview with Wim Wenders," in Cineaste (New York), vol. 16, no. 4, 1988. Helmetag, Gharles H., "Of Men and Angels: Literary Allusions in Wim Wenders' Wings of Desire ," in Film/Literature Quarterly (Salisbury, Maryland), vol. 18, no. 4, 1990. Hooks, Bell, "Representing Whiteness: Seeing Wings of Desire ," in Yearning: Race, Gender, and Cultural Politics , Boston, 1990. Cook, Roger F., "Angels, Fiction and History in Berlin: Wim Wenders' Wings of Desire (1991)," in The Cinema of Wim Wenders: Image, Narrative, and the Postmodern Condition , by Cook and Gerd Gemunden, Detroit, 1997. Ehrlich, Linda, "Meditations on Wim Wenders' Wings of Desire ," in Literature/Film Quarterly (Salisbury) vol. 19, no. 4, 1991. Caldwell, David, and Paul W. Rea, "Handke's and Wenders' Wings of Desire : Transcending Postmodernism," in German Quarterly (Philadelphia) vol. 64, no. 1, 1991. Caltvedt, Les, "Berlin Poetry: Archaic Cultural Patterns in Wenders' Wings of Desire ," in Literature/Film Quarterly (Salisbury), vol. 20, no. 2, 1992. 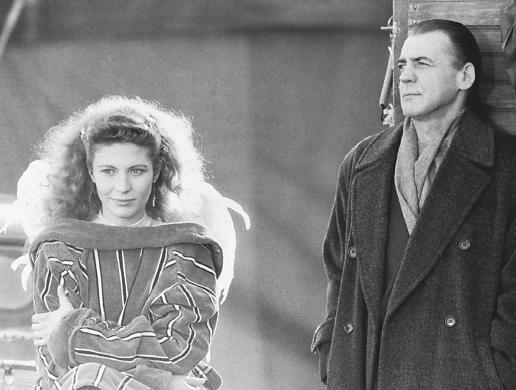 On one level, Wings of Desire's plot outline could be seen as the purest Hollywood-style claptrap: an angel falls in love with a mortal woman—a trapeze artist, no less!—and trades in his wings to be with her. On another level, it may be taken as a meditation on themes that have preoccupied German literature since before the age of Goethe: oppositions of spirit and matter, eternity and time, the abstract and the concrete. Of course, the film gloriously refuses to exist on merely one level, or address itself to one kind of culture—it prefers to have Rilke's angels from the Duino Elegies hobnob with TV's Columbo. The film could be called perfectly postmodern, except that its meanings are not all scattered on a glittering surface; rather, like a number of the great modernist works, starting with Joyce's Ulysses , Wings of Desire is a rich amalgam of high and low culture. Wim Wenders has pointed out that the pun in his German title ( Himmel means both sky or heavens and Heaven) is untranslatable into English, besides the problem that " The Sky Over Berlin sounded like a war movie and Heavens Over Berlin was too romantic." On the other hand, "desire" (French désir ) does not, according to Wenders, translate properly into German, so he sees both titles as valid. Whichever title one uses, the film is certainly—on one level, one must keep adding—about Berlin itself as much as anything else. Indeed, the film now serves as a document of those last years before the Wall came down, when Potsdamer Platz was still a no-man's-land of the most forlorn bleakness, yet graffiti on the Western side of the Wall was making political/aesthetic statements of protest and renewal. One can imagine Wenders spinning his fantasy plot outward from the monuments of Berlin itself: the winged Victory Column inspiring the angels and their lofty perspective; the Wall suggesting every sort of division between humans (one of the characters complains that nowadays everybody needs a password or a toll payment to talk to another person); a modernistic library building—austere and yet somehow spiritual and grandly calming—serving as a suitable hangout for the angels, who love to accumulate knowledge; Potsdamer Platz and other empty spaces representing the memory erasures and feelings of desolation of postwar German life (though even these spaces can be enlivened by a circus or a mural! ); and in opposition to the Wall and the vacant lots, the ubiquitous coffee-and-sandwich stands, which bring people (and angels) casually together. Berlin's dark Nazi past is evoked both through intercuts of newsreel footage and through the subplot of a movie being shot that uses the fall of Berlin as the backdrop for a detective story starring Peter Falk. (The set featuring a half-bombed building is truly Piranesian in its shadowy depths, though these scenes of the film, showing Nazi horrors made grist for the entertainment mill, also tell us something about the endless self-replications of the postmodern 1980s.) Wenders' Berlin is also an international city: many languages are heard briefly in the course of the film, and two of the major characters, Falk and Marion, speak (and are heard thinking) in English and French respectively. To be sure, a viewer might perceive the entire film not as about Berlin but the other way around, with the city merely providing convenient metaphors for the human condition—but this would ignore the film's rich specificity. As for what Wenders means by "desire," one must first consider what the angels lack—which means figuring out what they are. These soberly dressed but ponytailed creatures that hover over the city and lean over the shoulders of its citizens are not messengers in the biblical manner, or charioteers to the afterlife as in the ghastly sentimental remake, City of Angels . They are, however, recorders and comforters. They take notes and share stories with one another of lovely, quirky details of humans' lives, or of the natural world in the days before human occupation. (Evidently the angels have inhabited the local terrain since prehistory; only with humankind's arrival have they learned to speak—and laugh.) They do appear to bring moments of peace or inexplicable joy to people in unhappy straits, though they cannot prevent accidents or suicides. Children see them, and are amused, but as in Wordsworth, they lose their intimations of some kind of immortality as they age. Often the angels seem to be an allegory of a certain type of artist, whether poet or painter or filmmaker (Cassiel keeps a notebook; ex-angel Falk is a sketch artist; Wenders' camera and microphone seem endlessly curious): they feel deeply, they love the particulars of everyday life, but they don't make contact, they don't exactly live , they only record. Significantly, they are color blind—a "dimension" is missing. Thus when Damiel falls in love with Marion she is not only an actual woman but the embodiment of life in the flesh, of "becoming" (including changing and dying) rather than pure "being." When he wakes up mortal, he does go looking for her at once, but he is also eager to ask a passerby the names of the colors he now sees decorating the Wall, and to taste his first cup of coffee. A number of critics have argued that the film falls into a very traditional male—or male filmmaker's—perspective, regardless of whether Marion is a woman, Woman in the abstract, or "earthly delights"; put most simply, the angels and Wenders' camera are voyeurs, most obviously when Damiel watches Marion undress in her room. However, it is important to note that Damiel wants not merely to watch—or to dominate/possess through seeing—but to make contact with Marion, to communicate. Later, when he and Marion finally meet, is it she who finds him—his back is to the camera as she approaches him—and she who does the talking in a rather remarkable and lengthy speech. Kolker and Beicken's book on Wenders claims that the director and his co-writer Peter Handke reclaim male dominance at the point when Marion tells Damiel the choice is now his (they also find her speech leaning toward fascism when she proposes conceiving what they call a "master race" with him). But telling someone he must act is not the same as relinquishing one's own free will, and the intense close-ups of both characters at the end of the speech suggest a relation of equality. One must say too about Marion's speech that however serious it may look in script form, it is so extravagant (especially compared to most bar pickup lines), and its very first words—"Now it's time to get serious"—are so bold and spoken with such quiet amusement by Solveig Dommartin, that it is outrageously romantic and droll at the same time. Indeed, the entire film has an essential component of whimsy, even outright comedy, which is often overlooked by critics. One finds it in the almost goofy earnestness of Bruno Ganz's Damiel, and in the casting of Peter Falk as an ex-angel. (Falk's down-to-earth geniality—though he also has a serious awareness of Berlin's past— casts a kind of spell over much of the picture.) There is whimsy too in the very idea of an angel falling in love with—and literally looking up to—a trapeze artist who even wears little wings as part of her act. (Early in the film, when a stagehand makes a joke to Marion about "an angel passing by," he is just alluding to her wings, but the invisible Damiel is comically thunderstruck.) And let us not forget that these angels who often seem on the verge of quoting Rilke are also quite serious fans of punk rocker Nick Cave and the Bad Seeds. Though far from making a joke of his whole proceedings, Wenders does undercut his own (or perhaps Handke's) tendency toward solemnity again and again. When Damiel talks with Cassiel about his frustration with his own "spiritual existence"—as they sit in a BMW convertible in a showroom!—he speaks abstractly about wanting "now" instead of "forever," but concludes that "it would be quite something to come home after a long day, like Philip Marlowe, and feed the cat." When he actually becomes human—falling asleep and gently placed by Cassiel on the West side of the Wall, a moment echoing Wagner's The Valkyrie , when the newly mortal, formerly winged-helmeted Brunnhilde is laid to rest by Wotan—he is rudely awakened by his angel's armor crashing down upon him. But most purely hilarious is the inexpressibly weird jacket he trades his armor for. Finally, turning from drollery to a child's delight, one must consider the circus setting in itself. Circuses are by no means always amusing in movies, and American viewers should keep in mind that in much European art the acrobat is not a frivolous, "flighty" person but a richly poetic figure; but Wenders does stress the pleasure children take in the whole show, while seeming himself as fascinated by Marion's act (shown to us at great, even self-indulgent length) as they or Damiel. For all its leanings toward abstraction and symbol, and its moods of deep seriousness, Wings of Desire is not only surprisingly lighthearted, and hopeful about love relationships (Wenders' previous Paris, Texas had shown some hesitant moves in that direction), but consistently sensuous in image and sound. Much admiration has been expressed for the cinematography of Henri Alekan, whose camera does its own swooping and calm gliding, even when not directly implying an angel's point-of-view. The film has a wonderful sense of light even in shots of the most ordinary city streets, and Wenders never sinks to the spiderwebs-glistening-with-dewdrops cliches of some other filmmakers when conveying the beauty of the everyday. The switch from black and white to color when Damiel loses his wings may be a trick Wenders learned from The Wizard of Oz and another angel movie, the Powell/Pressburger A Matter of Life and Death , but it is not a simple gimmick, for he uses color shots earlier in the film to cue us in that there are other ways of seeing besides the angels', and he will continue to render Cassiel's scenes in black and white. As for the sound design of Wings of Desire , it is in many ways as brilliant as the images, and unusually complex in its weaving of voiceovers of people's thoughts with an ongoing poem of Handke that speaks of "When the child was a child." and with music ranging from the somber strings of Jürgen Knieper's soundtrack to the live circus music and the hypnotic performances of Nick Cave. Wings of Desire inspired a 1997 American remake, which has some fine images of angels on the rooftops and beaches of Los Angeles but is leaden in almost every other respect. (The profession of acrobat not deemed "serious" enough, Marion becomes a brain surgeon, and dies in an accident, while much of the film is occupied with debate over believing in the supernatural—an issue not of the least concern in Wenders' film.) Wenders himself made a sequel in 1993, Faraway, So Close , in which Cassiel too becomes mortal and a number of new characters are introduced, including an allegorical figure of Time. Though filled with moments of great interest, the relatively baroque plot and the repeating of some familiar material make the sequel seem less fresh, less beautifully clear in its outline, than the original. Sad and funny, conceptual and sensuous, densely complex and as airily simple as a child's storybook, Wings of Desire is a remarkably balanced achievement and a landmark in German cinema.